Seeking company registration and work visa application in Singapore? Read this guide to get started. 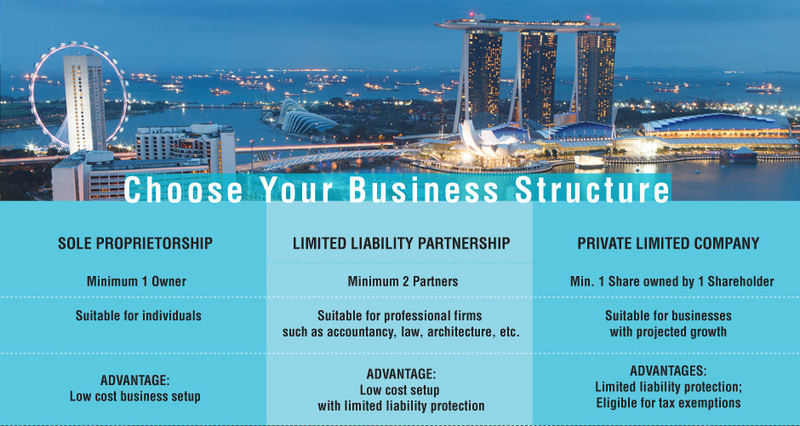 While there are five options to choose from, namely sole-proprietorship, partnership, limited partnership, limited liability partnership (LLP) and a private limited (Pte Ltd) company; the last one remains the most popular option as it is the most advanced and flexible business entity. A Pte Ltd is a separate legal entity with members having limited liability. Among its types, the most preferred type is an Exempt Private Company, which has no more than 20 shareholders (none among whom are corporate entities). Other options include a Private Company (with up to 50 shareholders), or a Public Company limited either by shares or by guarantee. Notably, foreigners who wish to set-up a company in Singapore must have at least one locally resident director. Individuals engaged in professional services such as lawyers, architects and accountants can go for a Limited Liability Partnership (LLP), which is a perfect blend of a partnership with private limited company set-up. This type is suitable for those looking for a company which is quick and easy to set-up, and even easier to administer. Please note that a business entity registered under the Companies Act of Singapore is an independent legal entity; thus, can own properties, enter contracts, sue and be sued. Importantly, Singapore tax regime recognizes the importance of easy cash flow for start-up companies in their initial years of operation. Therefore the system extends support in the form of sizable exemptions to resident qualifying companies. Engaging a company registration specialist, which can also provide the local director, local company secretary and local registered address, can aid in incorporating the company with Accounting and Corporate Regulatory Authority (ACRA) in less than two working days. As it’s an internet age, the registration specialist can also assist you in registering your domain address on the web and search engine optimization so as to maximize the traction on your website. Here, you have to take a call whether to choose a .sg, .com or any other domain extension, depending on the market you’re targeting. Remember to choose the extension keeping in mind your business expansion plans and the long-term vision. Some registration specialists also provide common seal, minute book and statutory registers, as well as assist in opening the first bank account. It’s again your choice to go for a local or a foreign bank depending on your business requirements. Overall, Singapore’s OCBC and DBS banks have consistently ranked as among the strongest banks in the world. So going for these is always a very good choice. Apart from the usual fund-raising methods adopted by start-ups world-wide such as equity fund-raising, angel investors, private financing, and venture capitalism, there are various government financing schemes available for companies in Singapore. These include funding options via SPRING Singapore, various tax exemptions and incentives, investment allowances, the Productivity and Innovation Credit (PIC) Scheme, as well as a range of grants and support programmes. 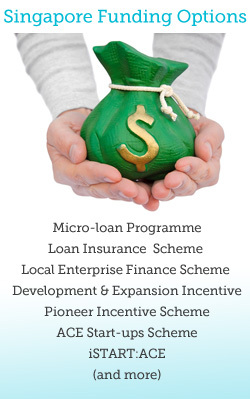 Few examples are the micro-loan programme, Loan Insurance Scheme and Local Enterprise Finance Scheme (LEFS) offered by SPRING; Development and Expansion Incentive; Pioneer Incentive Scheme; ACE Start-ups Scheme; and iSTART:ACE. For new start-ups in the social entrepreneurial sector, ComCare Enterprise Fund and New Initiative Grant are the choices. In most cases, the above-mentioned funding assistance from government agencies is available only for Singaporean entrepreneurs and majority-owned Singapore entities. Though, some exceptions are made to teams with foreign entrepreneurs, or firms jointly-owned by Singaporeans and foreign entrepreneurs. Once you have zeroed in on Singapore as the destination for your next business venture, chosen a business structure, registered your company with ACRA and raised funding, the final step is to get the work visas and set the ball rolling. In this also, a licensed employment agency with Singapore’s Ministry of Manpower (MOM) can offer a full spectrum of services including reviewing candidacy, acting as a liaison with MOM, applying for the work pass, processing renewals, appealing and tracking the application. Work visas in Singapore range from work permits for domestic workers and labourers, S Pass for mid-level skilled workers, to Employment Passes (EP) for experienced professionals, managerial personnel, executives or specialists with good credentials. Note that relevant skills, educational qualifications and professional background matter in securing a Singapore EP. Candidates from tier one countries/region and ones with skill-sets not locally available, generally fare better. It also helps if the candidate’s job scope and job title matches each other, as well as if his or her prospective salary is commensurate with experience and qualifications. Finally, if the foreign talent is being hired by a niche industry such as tect start-ups, or by an established company with successful track-record of more than three years, the EP approval rates are high. Another type is the Entrepreneur Pass, which is designed for technopreneurs as well as R&D-intensive enterprises that can inject innovation and vibrancy in Singapore. Businesses that are involved in the development or application of innovative technology, or contribute to the flourishing of innovative creations, stand a better chance of having their Pass application approved. The applicant of this Pass must either hold a nationally-recognised intellectual property (IP), have at least S$100,000 funding from a recognised venture capitalist, supported by a Singapore government agency, is an incubate at a government-approved incubator, or has research collaboration with recognised research institutions. Please note that draft blue print of the business must include a plan to spend at least S$100,000 [total business spending which doesn’t include royalties, payments made to overseas companies and remuneration to immediate family], and hiring of at least two Singaporeans in the first year of operation.